Opening night of the 2013 UCLA Festival of Preservation is this Friday evening, March 1st. The Festival of Preservation is a biennial month-long series celebrating the work of the UCLA Film and Television Archive. The screenings take place at UCLA's Billy Wilder Theater in Westwood. 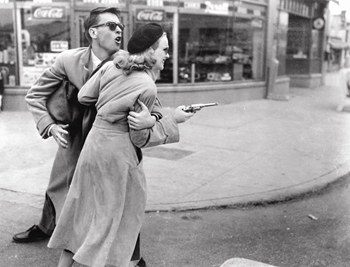 In 2011 I enjoyed seeing restored prints of CRY DANGER (1951) and THE CRUSADES (1935) at the festival; this year I hope to attend even more films, starting with the opening night screening of GUN CRAZY (1950). Although I just saw GUN CRAZY last April when Peggy Cummins appeared at the TCM Classic Film Festival, I couldn't resist the opportunity to see Russ Tamblyn interviewed at UCLA Friday night. Russ, billed as Rusty Tamblyn, plays John Dall as a child in the opening scenes. There are quite a few other film noir titles on this year's schedule. 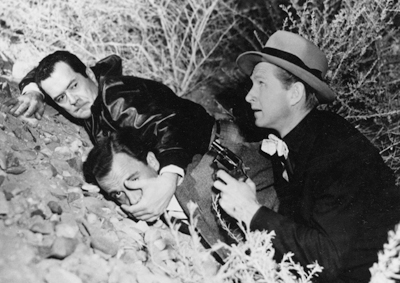 On Monday, March 4th, Eddie Muller of the Film Noir Foundation will be hosting TRY AND GET ME (1950), aka THE SOUND OF FURY, along with REPEAT PERFORMANCE (1947). Both films are also due to be shown at the Noir City Festival in Hollywood this April. TRY AND GET ME stars Frank Lovejoy, Richard Carlson, Kathleen Ryan, and Lloyd Bridges, while REPEAT PERFORMANCE stars Joan Leslie, Louis Hayward, and Tom Conway. Fellow film fans may remember that the 2011 For the Love of Film (Noir) blogathon raised funds which were contributed to the TRY AND GET ME restoration. 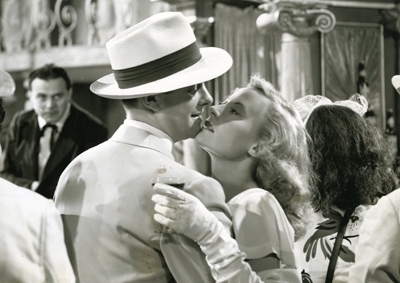 On March 10th, the schedule features THE CHASE (1946) and HIGH TIDE (1947). THE CHASE stars Robert Cummings, Steve Cochran, and Michele Morgan; HIGH TIDE stars Lee Tracy and Julie Bishop. HIGH TIDE is also scheduled for the Noir City Festival. Monday, March 11th is a must-attend event. James Cagney, Grace George, and Marjorie Lord in JOHNNY COME LATELY (1943) is followed by THE INSIDE STORY (1948) which has a cast of personal favorites, William Lundigan, Marsha Hunt, and Gail Patrick. Even better, Marsha Hunt and Marjorie Lord will be there on the 11th in person! Another title I'd really enjoy seeing on a big screen is THIRTY DAY PRINCESS (1934), starring Cary Grant and Sylvia Sidney, which will be shown on March 23rd. It's a charming film about a princess who has a commoner double; the story calls to mind everything from THE PRISONER OF ZENDA (1937) to PRINCESS O'ROURKE (1943) to ROMAN HOLIDAY (1953). The above are just a few titles of personal interest; there are many more films on the schedule. Please visit UCLA's schedule for a complete list of festival titles. Update: Here's an article on the festival from Kenneth Turan of the Los Angeles Times. Update: 2013 Festival of Preservation Opens at UCLA. What a great night, with Russ Tamblyn at a screening of GUN CRAZY! Update: My reviews of TRY AND GET ME (1950), REPEAT PERFORMANCE (1947), THE CHASE (1946), HIGH TIDE (1947), JOHNNY COME LATELY (1943), and THE INSIDE STORY (1947) have now been posted.